Why isn’t there an app? Craigslist, eBay, etc., all have apps. Are you working on one? We’re a much smaller team than sites like craigslist or ebay have, but yes, we are planning one. The first step though is to make searchtempest.com itself better on phones. We’re well on the way there, and hope to have a new, much improved homepage ready to test early in the new year, with a results page to follow. Once the site update is finished, it should perform much better on phones, as autotempest.com already does. At that point, we’ll see if it’s possible to improve the experience any more with a dedicated app, and if it is, we’ll make one. I understand that it’s past time we had these things, so thanks for your patience! Ever since you made this “Direct Results” addition, Search Tempest has ceased to work the same for me. My latest issue? When conducting a Craigslist search, the first few cities load fine, and then all of a sudden I see “Retrieving Results from Google”, but nothing loads again. It just keeps searching. I have cleared the cache, to make sure there was nothing off there. I’ve tried searching using different zip codes. Nothing changes. The search starts out fine and then just gets stuck “searching”. All sorts of “bugs” seemed to show up after changes were made to Search Tempest. And this happens, regardless of whether I am in private mode or just using Google. I feel like I need to start looking around, to see if there is a viable alternative. I am guessing I am not the only one having these issues. As mentioned there, the new Google api limit only took effect a couple days ago, and we’re still working on the best way to deal with it. Direct Results has been an option since 2009,so I don’t think it’s related. If you mean the default sort change described in this blog post, as mentioned above, we have since changed it back. We’ve also added the supplemental Bing results to our separate cities view. Please do check out the alternatives. I’ve yet to find one that’s ahead of us in features or completeness of results. If you do find one you like though, I’d really appreciate if you let us know what you like about it. It may show us ways to improve! Yes, but if I click “Direct Results”, it appears that if I want to use that functionality, I need to click on each city individually? That would be much more time intensive. Prior to the changes, all of this information automatically loaded for me. Now it seems that I have (2) options: Either get a much reduced list of information, compared with what I am used to getting OR do a Direct Results search, which means I need to click on each city directly in order to see whether any good results exist. I wish that no changes had been made. What was wrong with the way it has been all this time? Why were changes necessary at all? I can’t see how any of the changes / new offerings have improved my experience as a user – unless I am really missing something here. OK, if you want it back the way it was, just click the “Sort” dropdown box near the top of the results page, below the dark search bar, and choose “by distance”. All we changed was the default sort order. As for Direct Results, it’s a different option that has been available all along. It does require viewing the results on each city separately, but we provide an index with a “Next” button to flip through them quickly. The exception is if you’re on a phone or tablet. Since it isn’t possible to display a separate index window in that case, you do have to click each city, as you say. So, Direct Results works best on a regular computer and/or for searches for relatively few cities, especially when you want to be sure to get every result immediately. Since the change, I am getting almost no results from my search and nothing shows up from Bing. While I had noticed a drop in search results beginning in May, I could still find items of interest. I used your service daily and purchased lots of items. I will pay to go back to the previous search process or I will have to give up on Searchtempest even though I have recommended it to many people. The current search is of no use. There’s no need to pay; if you want to go back to Separate Cities sort, all you have to do is choose it from the “Sort” dropdown box near the top of the results page, under the search bar. 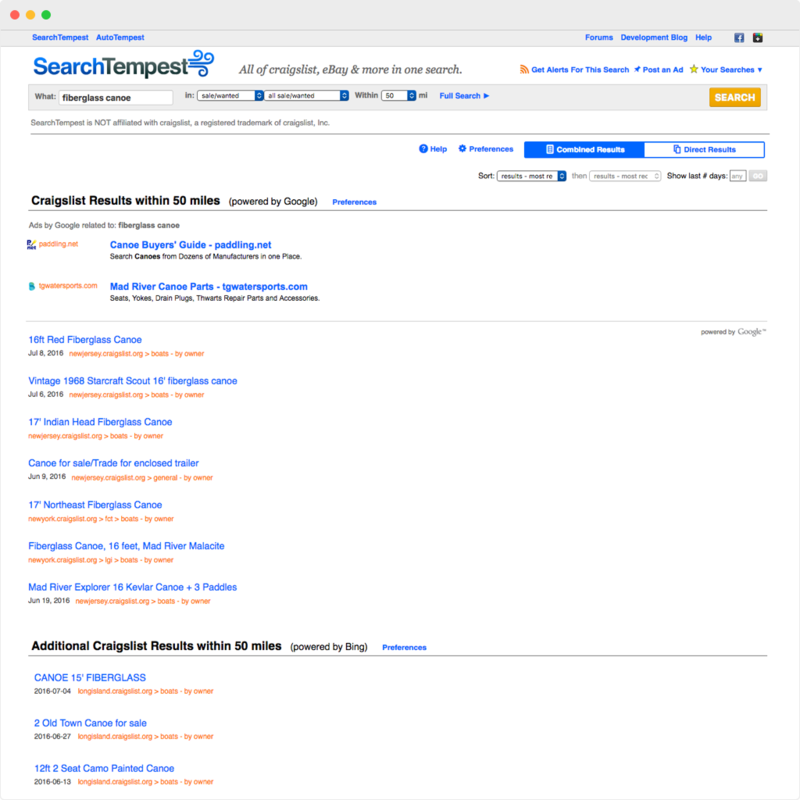 That said, it’s very odd that you’re not getting anything at all from Bing, so I would suggest contacting us via http://www.searchtempest.com/contact so that we can look at your specific search and see what’s going on there. I agree. It is funny that they are saying that what they did should “help” the accuracy of searches, intimating that the previous product was substandard. What I know is that the searches I previously did actually got MUCH better results than what I am getting now. I thought the problem was on my end, but now I realize that this was a system change. Whatever was done, for whatever reason it was done, took Search Tempest from a product that was head-and-shoulders above the others out there, to a product that is on par with the others. Most definitely, it downgraded the quality of what we were receiving – based upon my experience and what I am reading from others. BAD decision, inexplicable reasoning. Smh. But if you were happy with the results as they were before, again, you can switch back with two clicks. The Sort box can be found near the top of the results page, just below the search bar. Something has gone bad with the recent change. The results, combined or direct, ignore my zip code. The change only affects the default sort order. Zip codes are still handled exactly as before. Perhaps if you were sorting by distance before, and are now using a single list, you no longer get nearby results at the top, and so it seems like your zip is ignored. If that’s not it, please send us a message at http://www.searchtempest.com/contact so we can figure it out! Getting far fewer results today than ever. Whatever was changed has hindered all of my regular combined result searches. All we changed is the default sort. For existing users, you should still be on the same sort as before, and the results should be the same as a week or month ago. As I mentioned though, Google has bee doing a poor job of returning results, so we suggest changing your sort to one of the “Single List” options so that you can get Bing results as well. Does that help?